Two years ago this month, Hood County, Texas library director Courtney Kincaid embarked on what would ultimately be a successful defense of two LGBTQIA-themed children’s books that were challenged by more than 50 local residents: My Princess Boy by Cheryl Kilodavis and This Day in June by Gayle E. Pitman and Kristyna Litten. Although she has no regrets about standing up for the freedom to read, Kincaid was surprised by the very personal backlash that followed in the largely rural area. She recently spoke to Pat Peters, a blogger for ALA’s Office for Intellectual Freedom, to share her experience and provide tips for other librarians weathering intense challenges. The challenge was initiated by a frequent library patron with whom Kincaid had a good relationship until that point–so much so that the mother of three young children had served as a personal reference when Kincaid applied for the library director position a few years earlier. But when the patron came across This Day in June, a children’s picture book about attending a Pride parade, she informally complained to library staff and said it should not be featured in a “new books” area. Since the patron had not yet filed an official challenge, however, it was returned to the display. Kincaid had been on vacation when the patron lodged her verbal complaint, but after returning she set up a meeting with the woman, hoping to head off any further escalation by talking through concepts of intellectual freedom and community-wide collection development. It was too late, however: Kincaid says the patron had already decided she “did not like the illustrations or words used in the book.” While she was at the library for that meeting, the complainant also found and checked out My Princess Boy, which is based on the life of gender-nonconforming Dyson Kilodavis and written by his mother. In response to the mass challenge, the library’s advisory board held a public hearing regarding the books. Twelve members of the public in attendance signaled that they favored removing the books, but none of them signed up to address the crowd; meanwhile, nine attendees spoke in favor of keeping the books and five more showed their support for that position. Ultimately the advisory board voted unanimously that the books should remain in the collection. Unsatisfied with that outcome, the would-be censors appealed to the Hood County Commissioners’ Court, which held another public hearing that drew more than 200 attendees. 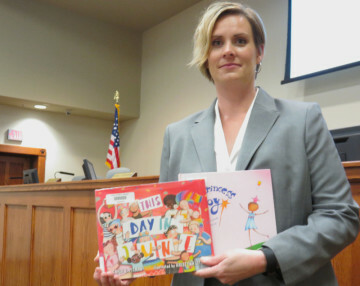 After hearing from Kincaid and from County Attorney Lori Kaspar, who rightly advised that removing the books would be unconstitutional, the commissioners somewhat grudgingly assented that it was not their place to meddle in library collections at all. Although Kincaid held up well under the stress, and she knew that much of the community actually supported her, she was nevertheless relieved to be offered a new job as assistant director of North Richland Hills Library in the Dallas-Fort Worth area, where she remains today. The battle also brought her much-deserved recognition and appreciation in the form of an I Love My Librarian Award from ALA in 2015 and an honorable mention in NCTE’s National Intellectual Freedom Awards in 2016. She is also the chair of the Texas Library Association’s Intellectual Freedom Committee for 2017-2018. I learned to listen to the patron with complaints, no matter how unreasonable their comments may seem. I learned to make certain the library’s policies are ready to handle a challenge of this magnitude. Unfortunately, our policies had not been approved by the Commissioners’ Court, but instead only by the Library Advisory Board. When I became director, we started researching, reviewing, and rewriting the library policies. Once again, I’m glad this situation happened because we were able to develop the library policies more thoroughly. I learned that sometimes you just have to shut your door and organize yourself and your information. I learned to have your facts memorized and printed up, ready to share with the court members, city council, newspapers, and news anchors. Finally, I learned that as long as I was able to stick to the facts and stay professional, I would be fine. Finally, Kincaid also shared a collection of resources on preparing for and responding to challenges–including CBLDF’s own How To Manage Challenges page. Read her full interview with Peters here, and once again thanks to Kincaid for standing strong in the name of intellectual freedom!